Central American migrants and refugees cross a bridge from Guatemala to Mexico in January 2019 to apply for humanitarian visas. Carlos Castellanos was half a mile from the border, sitting on a park bench just a few blocks away from the Guatemalan end of the bridge over the Suchiate River into Mexico. Castellanos is one of the more than 11,000 Hondurans to make the collective northbound trek in the second half of January, and he does not expect the exodus to stop. “Two years from now, Honduras is going to be left without people,” he told Truthout, watching fellow Central American migrants and refugees trickle into town. Castellanos is a welder by trade, but jobs were scarce in Honduras. To support his wife and two teenage children, he ran a little corner store out of the family’s home in San Pedro Sula, the country’s second largest city. But between the high cost of food, high school fees and expenses, and hundreds of dollars in water and electricity bills, they struggled to make ends meet. The cost of living was enough of an uphill battle, but Castellanos also had to contend with extortion by criminal groups. The payments they demanded were often more than he made from his store, and non-payment can have fatal consequences. Castellanos took out an informal loan to cover the extortion, but then became subject to more threats of violence when he had trouble making the loan payments. “I had been planning to leave for a month, because if I stayed any longer in Honduras, they were going to kill me,” he said. While thousands of migrants and refugees flee violence, unemployment, poverty and political persecution in Honduras, political turmoil continues to engulf the country. Nationwide protests against the government erupted on January 27, the first anniversary of the inauguration of Honduran president Juan Orlando Hernández’s controversial second term after his 2017 re-election was consolidated by the US government despite widespread reports of election fraud. The protests and ensuing crackdown occurred just days after two more ruling party former politicians were charged in the US with drug trafficking and weapons charges. The case against one of the two men charged is directly linked to the president’s brother, who was arrested in the US on similar charges in November 2018. A Honduran youth keeps the fires burning at a December 2017 neighborhood protest in Tegucigalpa against election fraud in Honduras. The National Party has been in power in Honduras since 2010, following a coup d’état. On June 28, 2009, Honduran military forces opened fire on the home of elected president Manuel Zelaya, abducted him in his pajamas, made a stop at an Air Force base that is home to a US Southern Command joint task force, and flew him out of the country. The US recognized the de facto president and supported elections later that year that were considered illegitimate by the broad resistance movement that formed in the wake of the coup. Violent crime soared amid the political instability, and Honduras soon held the distinction of having the world’s highest per capita homicide rate outside of an active war zone. In 2013, Hernández was elected president and the National Party remained in power, consolidating control of all three branches of government. Prior to taking office, Hernández had been president of Congress, which had previously carried out a technical coup against the judicial branch, ousting Supreme Court judges. The Honduran Constitution includes a strict one-term limit on the presidency. However, as has been the case in many Latin American countries, though in most other cases occurring under left-wing and progressive administrations, Honduran politicians found a way to circumvent the ban. A convoluted 2015 Supreme Court ruling facilitated presidential re-election, though it is still viewed by many as unconstitutional. Opposition forces united with the goal of preventing Hernández’s re-election. An Opposition Alliance Against the Dictatorship was formed between the LIBRE party that grew out of the resistance movement to the 2009 coup and is led by Zelaya, the much smaller center-left PINU party, which was founded in the 1970s to provide an alternative to the two-party system and militarization, and Salvador Nasralla, a former television sportscaster whose anti-corruption platform and status as a political outsider had garnered significant support. Nasralla became the presidential candidate for the opposition alliance, and he had a supposedly irreversible five-point lead when the preliminary results of the November 26, 2017, elections were first made public. Nasralla’s lead did not last. The electronic results transmission system went offline, and when it came back online, Hernández quickly began to overtake the opposition candidate. There had already been reports of vote-buying and election-tampering, but the sudden shift in results following the system outage sparked disbelief and outrage as Hernández emerged the victor. Nothing was made final for weeks, but Hondurans were not the only ones to dispute the results. The election observation mission of the Organization of American States concluded that due to widespread irregularities there could be no certainty about the results, and the organization’s Secretary-General called for new elections. Thousands march through the Honduran capital in December 2017 to protest election fraud. “Fuera JOH” (“Out with JOH” — the acronym for Juan Orlando Hernández) has been an ever-present rallying cry in Honduras and beyond ever since. While Castellanos told his story to Truthout up at the Mexican border, the chant sprang up a block away. Many Hondurans point to the Hernández administration, his re-election, and the violent state crackdown in response to protests as driving forces behind the exodus, and “Fuera JOH” chants have cropped up along the route of the migrant and refugee caravans, from their departure from Honduras all the way up to Tijuana, at the US border. 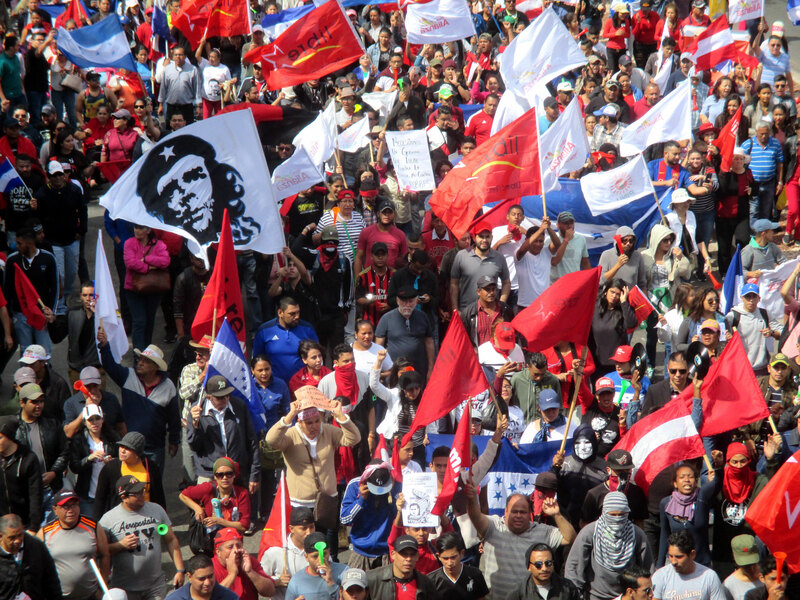 In the wake of the 2017 elections, “Fuera JOH” cropped up across Honduras as protests, rallies, neighborhood road barricades and highway blockades broke out around the country. It was shouted at noise demonstrations in defiance of the curfew during a 10-day state of exception declared by the government. It was written on signs held by protesters standing in the midst of tear gas clouds. The letters were laid out in sticks and set ablaze in the streets at nighttime capital city barricades while military police approached and began firing live ammunition. Security forces cracking down on demonstrations shot and killed some 30 people, but protests continued. More than one thousand people were detained and some remain in militarized maximum-security prisons awaiting trial on protest-related charges, but protests continued. After weeks of limbo, Hernández was officially declared the winner and US recognition of his victory quashed most hopes of changing the outcome, but protests continued. Protests still continue. On January 27, Hondurans took to the street around the country, following a week of sporadic protests leading up to the anniversary of Hernández’s second time taking office. Police and military forces cracked down on some of the more than three dozen sites of rallies, marches, and road, highway, and border blockade actions, firing tear gas, using rubber bullets, and detaining protesters and a journalist. In the southern Honduran city of Choluteca, where anti-government protests have been held every week since the 2017 elections, there were local reports of military forces firing live ammunition. A journalist reporting on an action in Tegucigalpa was hit by a rubber bullet he said was intentionally fired at him by an officer of the TIGRES, an elite police unit trained by US Army Special Forces to combat organized crime and drug trafficking. State violence is one of the reasons César Medina fled Honduras. The 21-year-old from Roatán, an island off the country’s Caribbean coast, has fled to Mexico several times over the past five years in search of work and to escape the violence back home. Some of that violence comes from security forces, he said. Police and soldiers face off against protesters during a December 2017 march in Tegucigalpa, Honduras. Despite corruption scandals and ongoing political instability stemming from a post-election crisis that was never resolved, the US has stood by Hernández. Honduras was the home base for US counterinsurgency operations and regional military training in Central America during the Cold War, when guerrilla forces were battling US-backed dictatorships in Guatemala, El Salvador and Nicaragua. Home to the only US Southern Command joint task force in Latin America, with the exception of Guantanamo, and to several forward operating bases used by US forces, Honduras maintains its pivotal importance to the US in Central America. US government and military officials recently reiterated their support for the Hernández administration. On January 22, US Vice President Mike Pence called Hernández to “reiterate the strong and collaborative relationship” between the two countries and commend the Honduran president on his response to recent migrant caravans. The Honduran government had increased checkpoints and scrutiny in border. Also on January 22, US Southern Command Commander Craig Faller visited Honduras and expressed support for security efforts and coordinated anti-narcotics operations. The very next day, the US Department of Justice announced drug trafficking and weapons charges against two Honduran former ruling party politicians: Amilcar Alexander Ardón Soriano, the former mayor of the El Paraíso municipality of the Copán department; and Mario José Cálix Hernández, an associate of former congressman Juan Antonio “Tony” Hernández, the president’s brother. The two men “each conspired to import massive quantities of cocaine into the U.S. and used heavy weaponry to protect drug shipments,” Manhattan US Attorney Geoffrey Berman said in a January 23 statement. Tony Hernández faces similar charges and was arrested in November 2018. His alleged associate Cálix Hernández, cousin to the Honduran police force’s anti-narcotics directorate, handed himself in to the US Drug Enforcement Administration on January 26, according to Honduran news reports. Amid ongoing political turmoil in Honduras and increasing links between the ruling party and drug trafficking, thousands continue to flee violence, unemployment, poverty and political persecution. A migrant and refugee caravan left San Pedro Sula on January 15, and the group has since grown and been joined by Salvadorans, Guatemalans and others. Under the new administration of President Andrés Manuel López Obrador, Mexico instated a temporary policy and offered humanitarian visas for a period of two weeks to the current wave of the collective Central American exodus. The visas will permit them to live, work and travel within Mexico for a year, with a possibility of renewal. Mexican officials have stopped registering new applicants under the special policy, but thousands continue to await their visas. On January 29, Mexican officials reported a cumulative total under the special policy of 15,552 humanitarian visa applicants, nearly a fifth of whom are children and teenagers. But as of January 29, only 4,750 visas had yet been issued. Hondurans are the overwhelming majority, representing more than 72 percent of the visa applicants. The others are primarily from Guatemala (14 percent) and El Salvador (11 percent), and the remainder is comprised of a few hundred migrants and refugees from Nicaragua, and between one and 10 people each from Haiti, Brazil, Ecuador, Belize, Cuba and Angola. A Honduran family sits on the bridge over the Suchiate River in January 2019, waiting for the line to advance toward the Mexican immigration offices. Not everyone has the same destination in mind. Many plan to travel all the way up through Mexico and hope to make it across the border into the US despite president Donald Trump’s onslaught of restrictions and deterrents affecting Central American asylum seekers. But many migrants and refugees plan to take advantage of the humanitarian visas promised by López Obrador and search for work within Mexico. Medina and Castellanos are among the latter group. Both have worked in Mexico in the past, and Castellanos even has a job waiting for him in northern Mexico, where his brother lives. Many migrants and refugees are traveling in family groups or with friends or neighbors, but others traveling alone form little ad hoc affinity groups along the way. That is what Castellanos ended up doing. On a bus from Guatemala City up to the border with Mexico, he met a Salvadoran and several other Hondurans and they have worked as a team ever since, buying food and making decisions collectively. Activists face military-run prisons and courts. An interview with Lenca activist Pascuala Vasquez on the legacy of Berta Caceres.